Can a Miracle Truss Building really be erected by just a “handyman” type like me? Yes! Miracle Truss® Buildings are designed for the do-it-yourselfer. With our simple bolt-together design our steel trusses are test fit and welded at the factory to ensure a perfect fit and therefore there is no welding to be done on the jobsite. Simply bolt your steel trusses together, and slide the lumber right into prepositioned steel clips and screw into place. Can I put a different type of roofing or siding material on the building (do I have to use steel)? Can you provide a custom roof pitch or non-standard sidewall height? Do I need a concrete slab in order to erect a Miracle Truss Building? While a concrete slab is always nice to work off of while you erect your new building it is not necessary to erect our design. If you have the time and budget, pouring the slab first however is always the easiest way to go. If your needs don’t include a full slab or you just don’t have it in the budget to start with, your Miracle Truss® Building can be erected and supported by simple concrete piers that the steel truss legs bolt to with just a gravel or dirt floor. If your plan is to pour a slab in the future, a slab can then be poured at any time as your time or budget allows. We will supply column placement plans that will help you with aligning where the piers need to go. Is Miracle Truss® a building broker? No! Miracle Truss® is directly partnered with its factory. Every Miracle Truss® building is manufactured to our own design and specifications (we do not buy and resell someone else’s product). We warranty our products as such, including our industry best 50 year frame warranty and are backed by 35+ years of structural manufacturing and design. Buy with confidence. Can you provide engineered building plans for my state? Upon request we will supply engineered stamped building plans your Miracle Truss® Building structure for any US state and Canada. Building overseas? We have options for that too! Did Miracle Truss go out of business? Previously a different corporation named Miracle Truss (under different ownership) sold high-quality steel web truss buildings, but later ceased operations. In 2015, our owner, who was a former team member from the original company, registered the rights to the name while also adding new, innovative design elements to the clear-span hybrid steel truss building system. 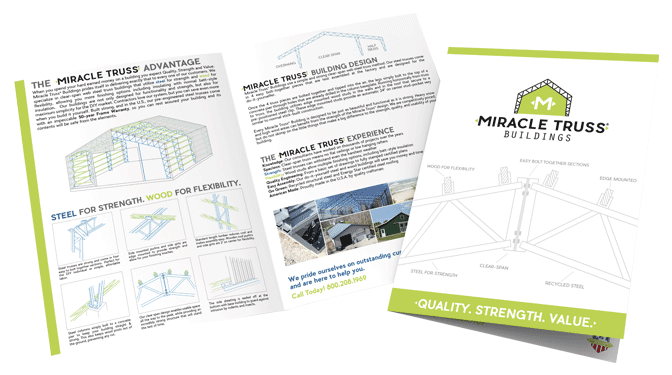 With a long history of these popular DIY buildings in the marketplace, we are proud to be able to provide an impeccable 50-year Frame Warranty for our pre-engineered steel trusses – see our In-Construction Building Gallery to see how our unique truss system works. We are a customer-centric operation, offering the highest level of personal service available in the industry. We work daily to make sure your project is successful. Did you read an unfortunate review about Miracle Truss from 2007? Please know that any review of Miracle Truss® prior to 2015 applies to the shuttered company – not ours. We use the Miracle Truss® name because it perfectly describes our philosophy and the “Miracle” of strength that our high-quality, precision pre-engineered steel trusses offer. We are a family run, Veteran owned business and our operation is staffed with experienced, customer-focused professionals who will help you insure that your construction project moves forward seamlessly. I see you are a hybrid building – does this mean your trusses have wood legs? No, our trusses are made out of steel and sit on steel legs (columns) that simply bolt to the top of a concrete pier. We do incorporate wood into the design however as our buildings utilize wood for the secondary members that go from steel truss to steel truss. Our clients tell us that we are the best of both worlds – steel for strength and wood for flexibility! Plus with our 50 year steel Frame Warranty you’ll never have to worry about wood posts rotting off in the ground. Steel legs for strength and longevity.